For today’s deals roundup, we’ve put together a bunch of smartphones in the list consisting of products from Samsung, Motorola, Lenovo and more. 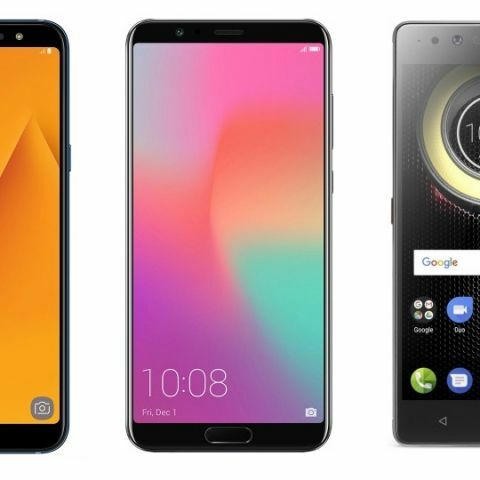 Today we have listed smartphone across various price ranges, which are available on the web with a hefty price cut. The list contains smartphones from well-known manufacturers like Honor, Samsung, Lenovo and more. The Moto G5s Plus sports a 5.5-inch full HD display with a resolution of 1080x1920 pixels. The smartphone features a 2.0GHz Snapdragon 625 octa-core processor with 4GB RAM and 64GB of internal memory. The smartphone is equipped with a 13+13MP dual rear camera and 8MP sensor at the front. You can purchase the device here. The Honor 7X features a 5.93-inch full HD display with a face recognition. It has 16MP+2MP dual primary camera and 8MP front-facing camera with a portrait mode. The smartphone packs 4GB RAM and 64GB of internal memory that is expandableby up to 256GB. You can purchase the device here. The Samsung Galaxy on7 Prime features a 5.5-inch full HD display with a thin bezels. The device features a 1.6GHz Exynos 7870 octa-core processor with 4GB RAM and 64GB of internal memory. It is equipped with 13MP cameras at the front and back. You can purchase this device here. The Lenovo K8 Note features a 2.3GHz deca-core Helio X23 processor with 4GB of RAM and 64GB internal memory. It also comes with a nano-coating that allows the device to remain functional even after a few splashes of water. You can purchase this device here. The Honor 9 lite is equipped with the Kirin 659 octa-core processor with 3GB RAM and 64GB of internal memory. The device features a 13MP + 5MP dual-lens at the front with a Portrait 2.0 mode. According to the company, the battery can provide 86 hours of offline music streaming and 13 hours of video playback in one go. You can purchase the device here. The Samsung Galaxy A6 Plus is a premium device that has a lot to offer to its users. The smartphone features a 1.8GHz Qualcomm Snapdragon 450 octa-core processor with 4GB RAM and 64GB of internal memory. It sports a 5.5-inch Super-AMOLED full HD display with a resolution of 1080x2280 pixels. When it comes to the camera, it has 16MP+5MP dual primary camera with a 24MP lens at the front. You can purchase this device here. WHY lenovo k3 note is not in top 10? Which camera is better Honor 6x, Moto G5 Plus or Samsung On Max? should i buy samsung galaxy s duos2 or pay more and buy motto g....??? ?